Jacinda Ardern has unveiled a new approach to running New Zealand’s finances. "We need to address the societal well-being of our nation, not just the economic well-being,” she said during a Davos discussion on More than GDP. This means that from 2019, her government will present a “well-being budget” to gauge the long-term impact of policy on the quality of people’s lives. In practical terms, child poverty figures will be presented at every budget. The onus will be on ministers to show how spending proposals will benefit people, and work with other ministers across party lines to ensure they have a positive, long-term impact, Ardern explained. “Our people are telling us that politics are not delivering and meeting their expectations. This is not woolly, it’s critical,” she said. Unprecedented wage stagnation is a major concern in OECD countries, hollowing out living standards for the majority of people and fuelling populism. The world's youngest female head of state said that trade wars and Brexit were a proxy for the frustration people felt over a political and economic set-up that had left them behind. 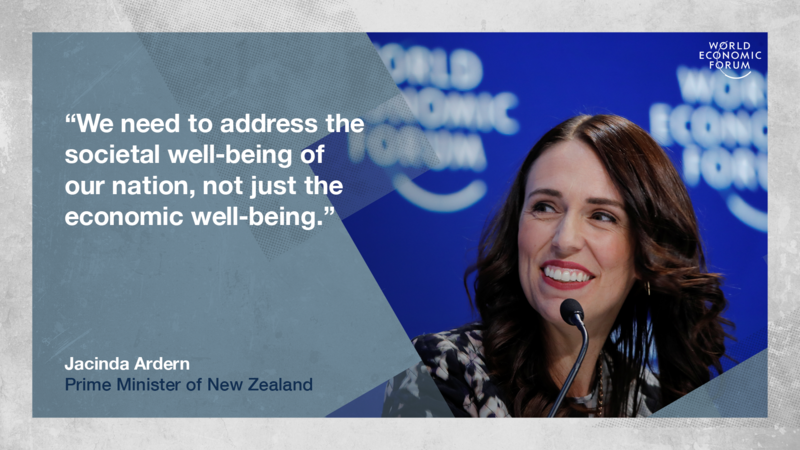 Ardern said that politics needed to be more altruistic, and more long-term, to address the deep-rooted challenges we’re grappling with as the economy changes. According to the New Zealand government website, the 2019 budget will use different measurements this year. The results will play out over decades - but Ardern argued for a shift beyond short-term cycles and for seeing politics through a lense of "kindness, empathy and well-being".